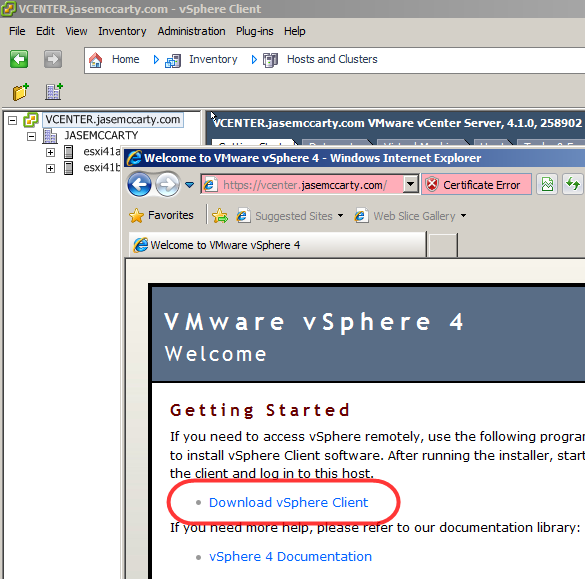 You have already upgraded VMware vCenter Server to 4.1. 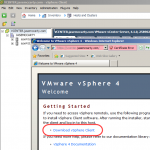 You realize that you downloaded vCenter Server 4.1 and either your ESX 4.1 or ESXi 4.1 media. 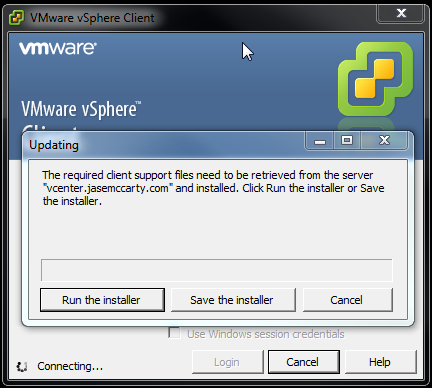 But… You didn’t download the vSphere 4.1 client. Remember that the 4.1 client is not included in the installation of ESX or ESXi. Now when connecting to an ESX/ESXi host with an older client, the same installer in the past would allow download of the client from the host. 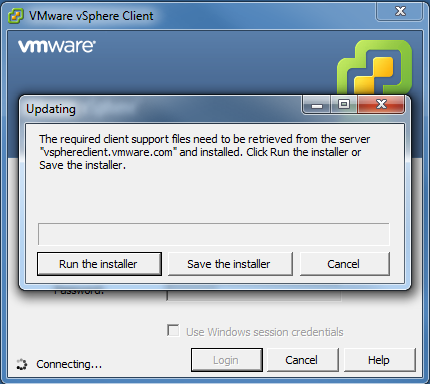 The host redirects the updater to vsphereclient.vmware.com to download the client. This can be a long process, or a short process, depending on your connection speed, as well as proxy settings, etc. Never fear, even though VMware didn’t bundle the client with ESX/ESXi, it is still available to download from your vCenter Server. 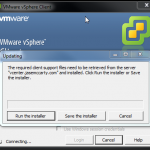 Or you can connect to the vCenter Server first to upgrade the vSphere client. Either way is better than having to download the client from VMware. The command is vi /usr/lib/vmware/hostd/docroot/client/clients.xml. Now press :w! to save the file, followed by :q! to exit vi. 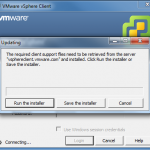 Now your ESXi host will point to your vCenter server to download the vSphere client. You could download it once, and host it on an internal web server. That would work in an environment that does not have vCenter Server installed. It seems to me that my host lost this setting after a reboot? Is this just a temporary setting? On ESXi, the setting is very likely until reboot, while on ESX it is persistent. Hm, I am using ESXi, so that is probably what happened. I wonder if there is a way to make it permanent. . .